Step 2: With the felt pen, draw an outline of the eyes and nose holes. Step 3: Set out paper towels so you don’t ruin your table. Trace the outline with the fabric glue. Let this set for 5-10 minutes. Step 4: So my goal here was to just start piling on the fabric paint and letting it drip down. What I did not realize is that the fabric paint is so thick that even in large amounts it stays put (I guess that’s good news for other projects though). This is when I grabbed a dish and mixed the paint with some water. You only need a few drops of water per teaspoon of paint. I accidentally put too much water and had to drain it. Then I added some Elmer’s glue – I honestly don’t know my reasoning behind this. Maybe I thought it would help bind the water and paint? Who knows, I never took physics. The mixture I ended up with actually worked out. Dip the paintbrush in the “slime mixture.” Don’t be afraid to get a generous amount. Start dabbing the top of the apple with the brush and let the mixture drip down the sides. The outline created in step 3 should prevent the mixture from dripping into the eyes and nose holes. Step 5: Every now and then I turned the apple upside down just so the paint wouldn’t cover up the entire apple. Step 6: Let the paint set for a few minutes. Optional: Before going glitter crazy, let the apple dry overnight. Once dry, remake the slime mixture and repeat step 4 to get another layer of drippy slime. This will add more texture and look more like the Disney version. NOW time for glittering! Step 7: GLITTER TIME! This step was a suggestion from Brit. It’s totally optional. But if you have a chance to glitter something, I don’t see why that should be passed up. I didn’t want the glitter to cover all the slime (but if you do, don’t waste money on green fabric paint since you’re not going to see it anyway. Elmer’s glue should do the trick). So, I poured glitter just on the very top of the apple. Then I grabbed it at the stem and shook it a little so the excess would trickle down the rest of the slime. Step 8: Let this dry overnight. I set mine on some parchment paper. Once it’s done, tie on a piece of twine and carry it around with you! This is fantastic!!! Thank-you for posting this project! Genius! I will have to make one too! Thank you so much for posting this project. 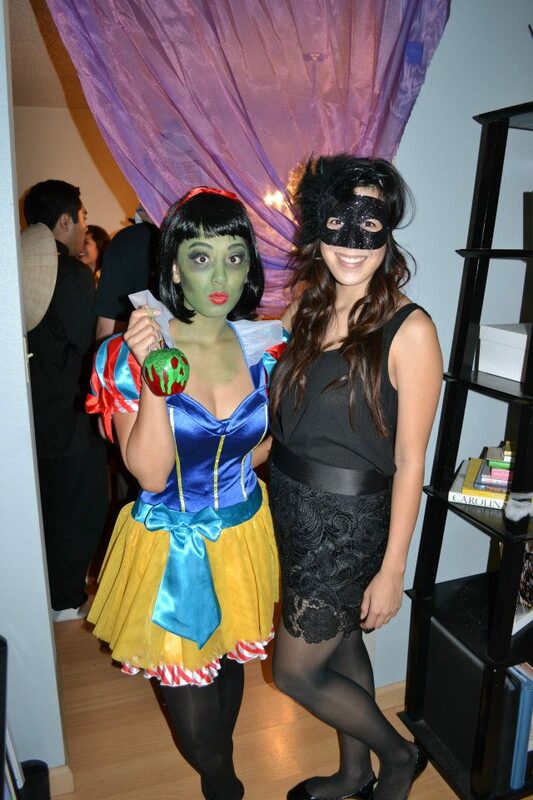 both my youngest daughter and i are gonna be Snow white for halloween this year! this is gonna work out prefect to add that little extra touch to our costume! 🙂 thanks again! Wonderful, I’m so happy this will complete your costumes! I made my own purse for my snow white costume this year and used this same technique to design it. Thanks so much for posting 🙂 it was so easy and inexpensive to make! Hi Elizabeth! So glad this tutorial came in handy. I would love to see your purse! 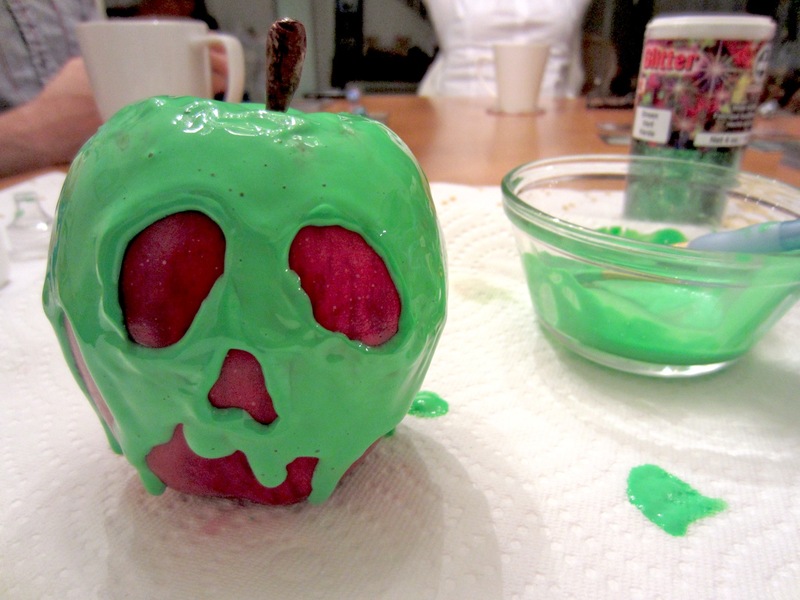 Can this be done with green candy melts to make the apple edible? Yes, definitely! I’ve done this as well, although you do need a lot more patience with the melts! Pingback: 18 Spine-Chilling Decor Ideas For The Spookiest Halloween!